The job role of an Appointment Specialist is to deliver excellent service by accurately processing customer’s appointments, communication and coordinating with other departments. 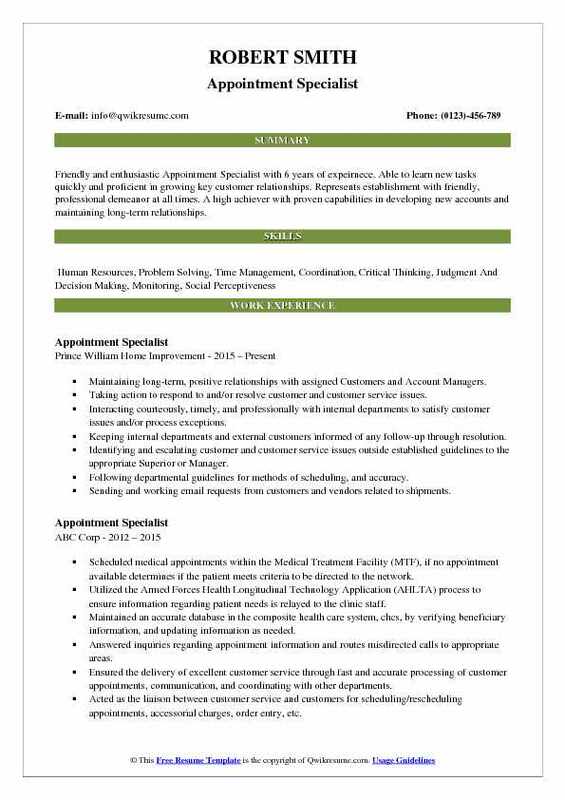 The job description varies from company to company, but the following are some of the general tasks mentioned on the Appointment Specialist Resume include acting as a liaison between the administration department and customers for scheduling and rescheduling appointments, building business relationship with customer service, providing accurate information to the related department about various appointments and schedules, tracking the work of the juniors and other employees, and performing all other duties as assigned by the administration. 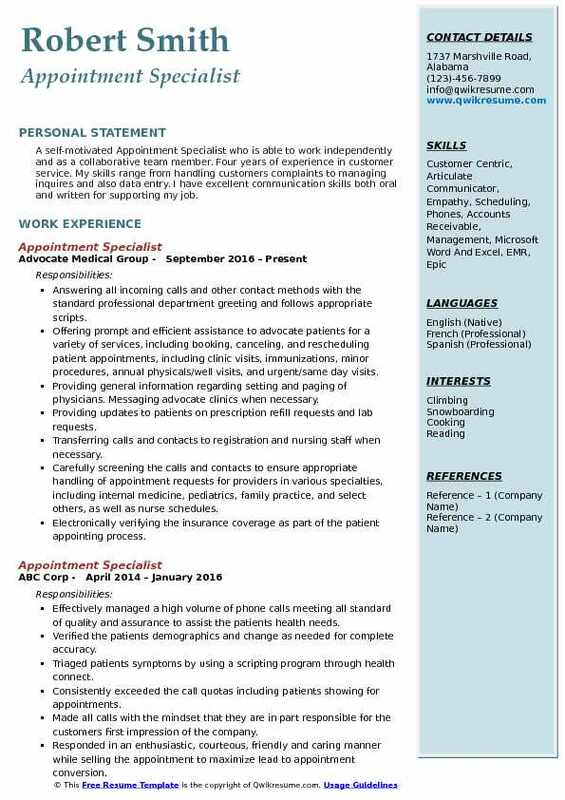 Candidates applying for this role should demonstrate on the resume skills such as – excellent time management and organizational skills, strong communication skills, the ability to multitask, the potential to supervise and give instructions, proficiency with job-related software and proficient typing skills. A Degree is commonly seen on most of the resumes. Summary : Highly enthusiastic Senior Appointment Specialist with 7 years client interface experience. Customer-focused Retail Sales Associate with a solid understanding of the dynamics of the retail apparel and shoe industry. Energetic and reliable Retail Sales Associate skilled in high-end merchandise environments. 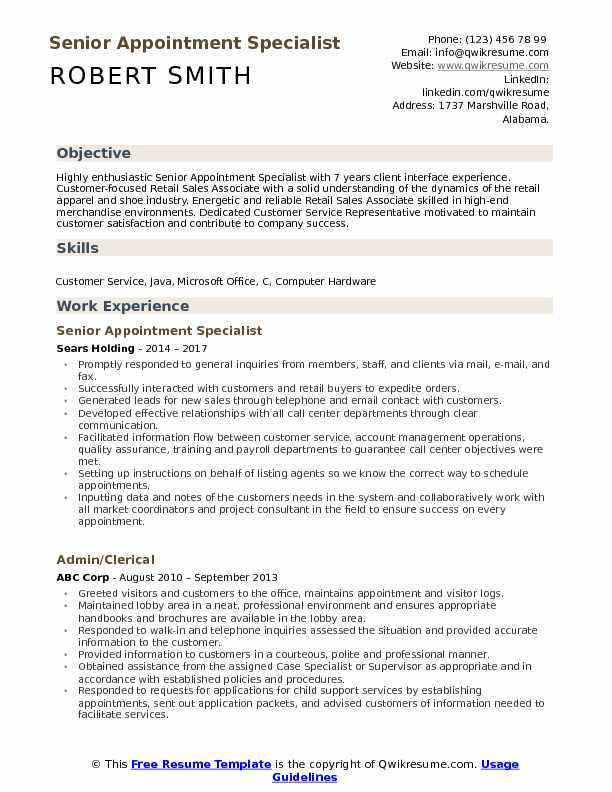 Dedicated Customer Service Representative motivated to maintain customer satisfaction and contribute to company success. Facilitated information flow between customer service, account management operations, quality assurance, training and payroll departments to guarantee call center objectives were met. Setting up instructions on behalf of listing agents so we know the correct way to schedule appointments. Inputting data and notes of the customer's needs in the system and collaboratively work with all market coordinators and project consultant in the field to ensure success on every appointment. Objective : Junior Appointment Specialist with 2 years of expeirnece who goes above and beyond basic administrative tasks and takes on multiple projects at once. Excellent work ethic and strength in boosting company morale. Strives to provide the excellent result of the job duties that are given to me and understand the importance of multi-tasking. I have used Microsoft Office Systems such as Word and Excel spreadsheets as part of my job duties successfully. Answering incoming calls from patients, doctors, nurses, and health care providers in regards to patients of advocate medical group. Sending messages or pages upon patients request when wanting to speak to their doctors. Starting the process of medication refills for patients, health care providers or pharmacies when calling in on behalf of the patient. Also, processing referrals and orders for patients or health providers upon request. Preregistering new patients to the advocate medical group following the specific guidelines of AMG. Verifying the patient insurance eligibility to schedule appointments for patients. Scheduling, rescheduling, canceling and confirming appointments for the patient upon their request. Meeting standards related to call responses, accuracy and customer service. 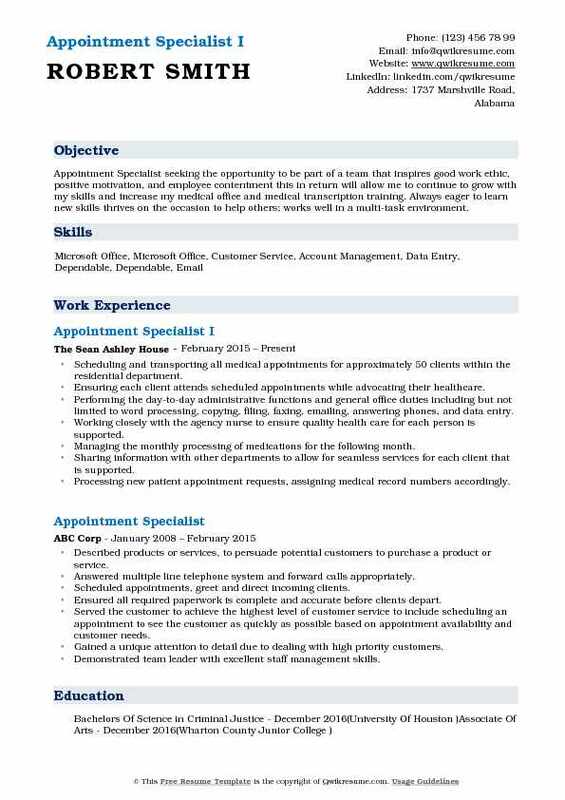 Headline : Friendly and enthusiastic Appointment Specialist with 6 years of expeirnece. Able to learn new tasks quickly and proficient in growing key customer relationships. Represents establishment with friendly, professional demeanor at all times. A high achiever with proven capabilities in developing new accounts and maintaining long-term relationships. Maintaining long-term, positive relationships with assigned Customers and Account Managers. Taking action to respond to and/or resolve customer and customer service issues. Interacting courteously, timely, and professionally with internal departments to satisfy customer issues and/or process exceptions. Keeping internal departments and external customers informed of any follow-up through resolution. Identifying and escalating customer and customer service issues outside established guidelines to the appropriate Superior or Manager. Following departmental guidelines for methods of scheduling, and accuracy. Sending and working email requests from customers and vendors related to shipments. Making outbound calls to customers in all regions about scheduling delivery appointments for LTL freight. 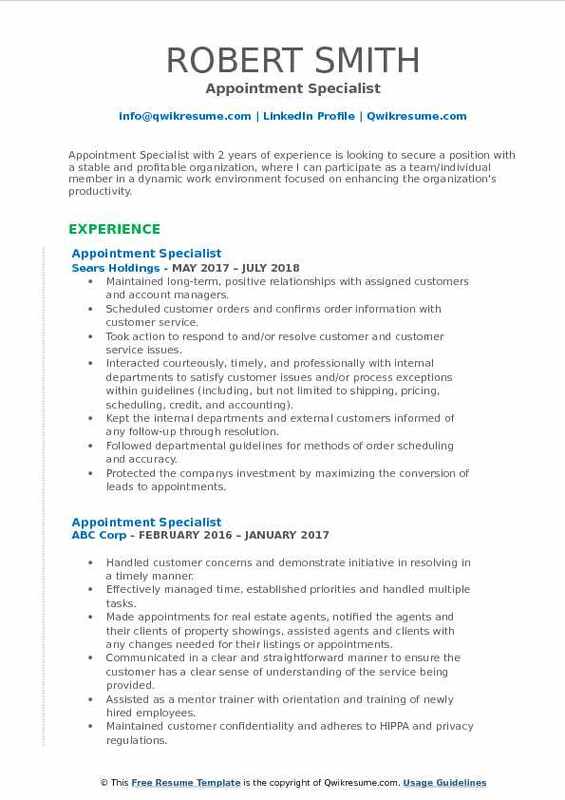 Objective : Appointment Specialist with 2 years of experience is looking to secure a position with a stable and profitable organization, where I can participate as a team/individual member in a dynamic work environment focused on enhancing the organization's productivity. Maintained long-term, positive relationships with assigned customers and account managers. Scheduled customer orders and confirms order information with customer service. Took action to respond to and/or resolve customer and customer service issues. Interacted courteously, timely, and professionally with internal departments to satisfy customer issues and/or process exceptions within guidelines (including, but not limited to: shipping, pricing, scheduling, credit, and accounting). Kept the internal departments and external customers informed of any follow-up through resolution. Followed departmental guidelines for methods of order scheduling and accuracy. Protected the company's investment by maximizing the conversion of leads to appointments. Maintained the good working relationship with marketing team members and sales force. Objective : A self-motivated Appointment Specialist who is able to work independently and as a collaborative team member. Four years of experience in customer service. My skills range from handling customers complaints to managing inquires and also data entry. I have excellent communication skills both oral and written for supporting my job. Answering all incoming calls and other contact methods with the standard professional department greeting and follows appropriate scripts. Offering prompt and efficient assistance to advocate patients for a variety of services, including booking, canceling, and rescheduling patient appointments, including clinic visits, immunizations, minor procedures, annual physicals/well visits, and urgent/same day visits. Providing general information regarding setting and paging of physicians. Messaging advocate clinics when necessary. Providing updates to patients on prescription refill requests and lab requests. Transferring calls and contacts to registration and nursing staff when necessary. Carefully screening the calls and contacts to ensure appropriate handling of appointment requests for providers in various specialties, including internal medicine, pediatrics, family practice, and select others, as well as nurse schedules. Electronically verifying the insurance coverage as part of the patient appointing process. 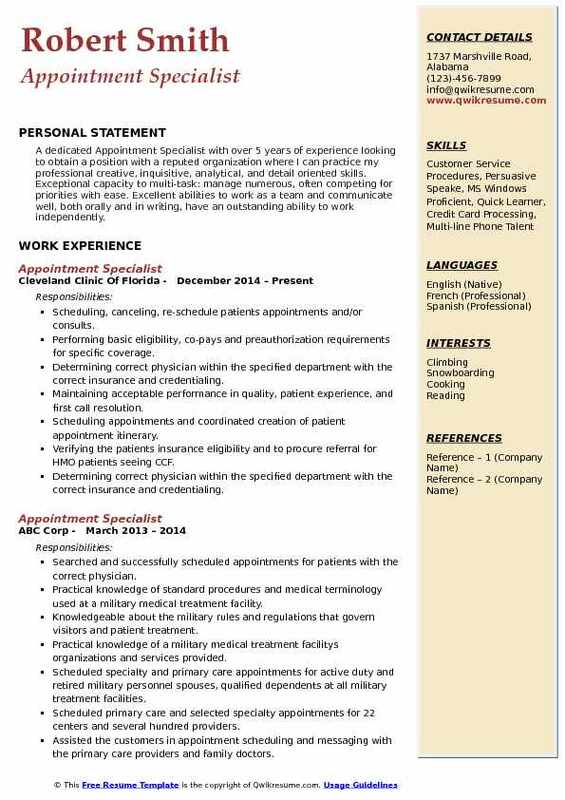 Summary : Appointment Specialist seeking the opportunity to be part of a team that inspires good work ethic, positive motivation, and employee contentment this in return will allow me to continue to grow with my skills and increase my medical office and medical transcription training. Always eager to learn new skills thrives on the occasion to help others; works well in a multi-task environment. Scheduling and transporting all medical appointments for approximately 50 clients within the residential department. Ensuring each client attends scheduled appointments while advocating their healthcare. Performing the day-to-day administrative functions and general office duties including but not limited to word processing, copying, filing, faxing, emailing, answering phones, and data entry. Working closely with the agency nurse to ensure quality health care for each person is supported. Managing the monthly processing of medications for the following month. Sharing information with other departments to allow for seamless services for each client that is supported. Processing new patient appointment requests, assigning medical record numbers accordingly. Obtaining and verifying the patient demographics and medical insurance information. 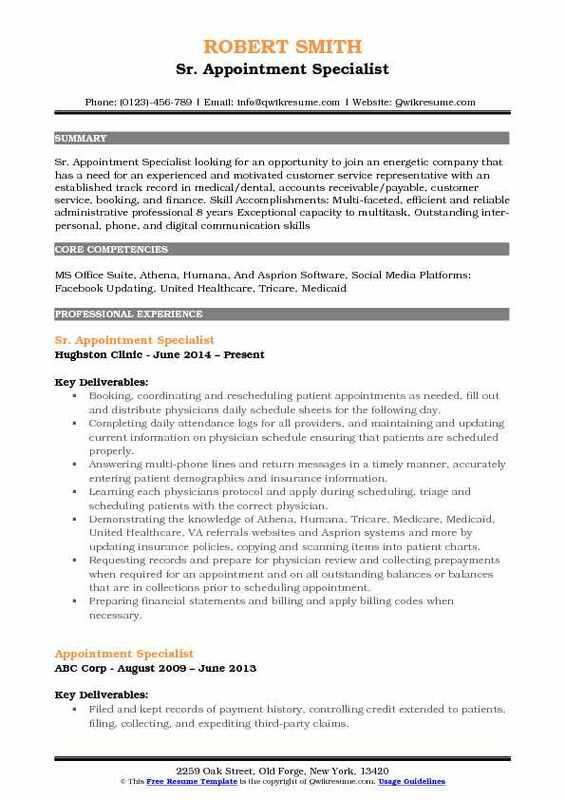 Objective : Appointment Specialist with 3 years of proven ability to work in unison with fellow associates and managers. Outstanding customer service and a proven leader with excellent customer service skills, a strong work ethic, and exemplary loyalty. I also have experience being an HR Clerk and a Receptionist where the experience built my multitasking skills, problem-solving, paying close attention to detail, and being able to answer multiple calls. Contacting customers to set intermodal delivery appointments 24 to 48 hours prior to de-ramping. Monitoring and rescheduling deliveries as necessary and research correct reason codes for internal tracking. Adhering to any special customer requirements for appointment scheduling. Communicating extensively with our marketing department on issues that may cause failure of service to our customers. Documenting and recording all involvement with loads such as emails sent, voicemails left, or customers contacted. Providing courteous and accurate responses to general inquiries from patients, clinics, physicians, coworkers, and management staff as part of our commitment to excellence in service. Coordinating the requests from hospitals, pharmacies, and clinics regarding patient accounts, or transfers these calls and contacts as needed. Booking, coordinating and rescheduling patient appointments as needed, fill out and distribute physicians daily schedule sheets for the following day. Completing daily attendance logs for all providers, and maintaining and updating current information on physician schedule ensuring that patients are scheduled properly. Answering multi-phone lines and return messages in a timely manner, accurately entering patient demographics and insurance information. Learning each physicians protocol and apply during scheduling, triage and scheduling patients with the correct physician. Demonstrating the knowledge of Athena, Humana, Tricare, Medicare, Medicaid, United Healthcare, VA referrals websites and Asprion systems and more by updating insurance policies, copying and scanning items into patient charts. Requesting records and prepare for physician review and collecting prepayments when required for an appointment and on all outstanding balances or balances that are in collections prior to scheduling appointment. Preparing financial statements and billing and apply billing codes when necessary. 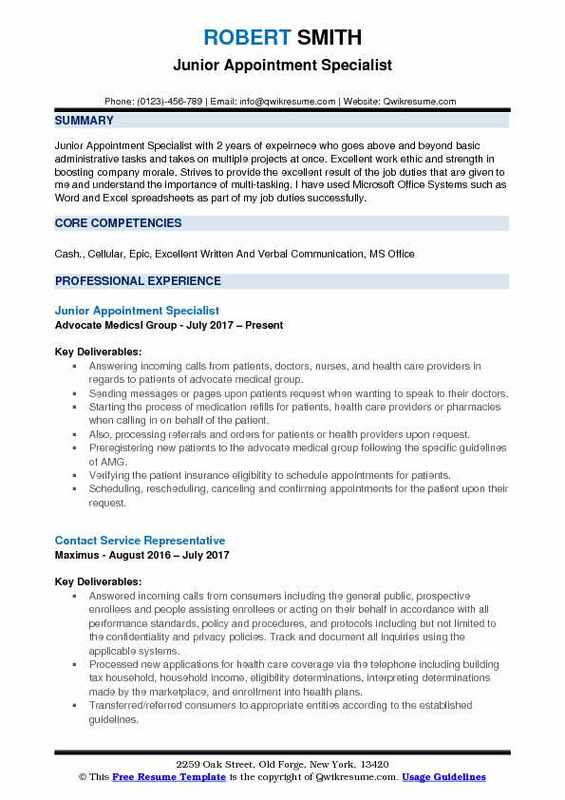 Headline : A dedicated Appointment Specialist with over 5 years of experience looking to obtain a position with a reputed organization where I can practice my professional creative, inquisitive, analytical, and detail oriented skills. Exceptional capacity to multi-task: manage numerous, often competing for priorities with ease. Excellent abilities to work as a team and communicate well, both orally and in writing, have an outstanding ability to work independently. Scheduling, canceling, re-schedule patients appointments and/or consults. Performing basic eligibility, co-pays and preauthorization requirements for specific coverage. Determining correct physician within the specified department with the correct insurance and credentialing. Maintaining acceptable performance in quality, patient experience, and first call resolution. Scheduling appointments and coordinated creation of patient appointment itinerary. Verifying the patients' insurance eligibility and to procure referral for HMO patients seeing CCF. Processing the preregistration of new patients to the clinic and schedules consults and follow-up visits. Coordinating the calendar and travel itinerary 3-6 weeks in advance to ensure availability of meetings. 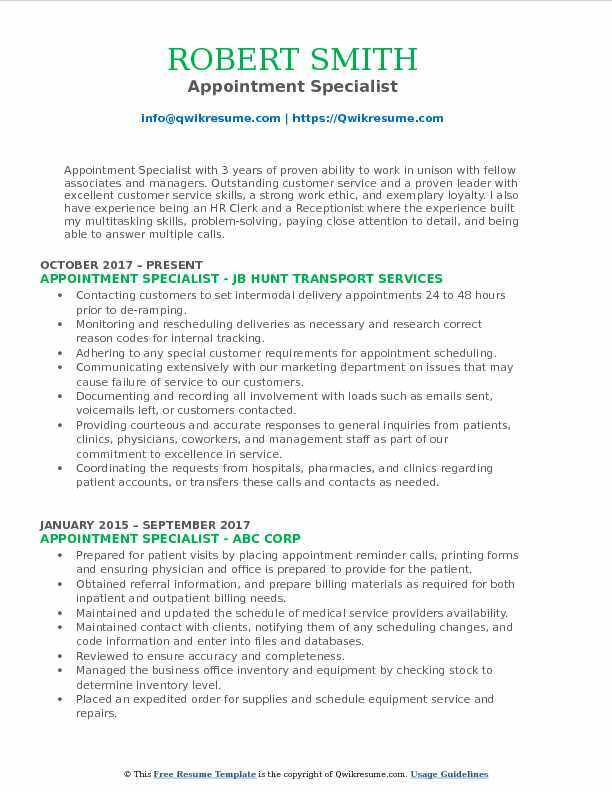 Objective : Goal driven and seasoned Appointment Specialist with 2 years of experience including Management and System Configurations. 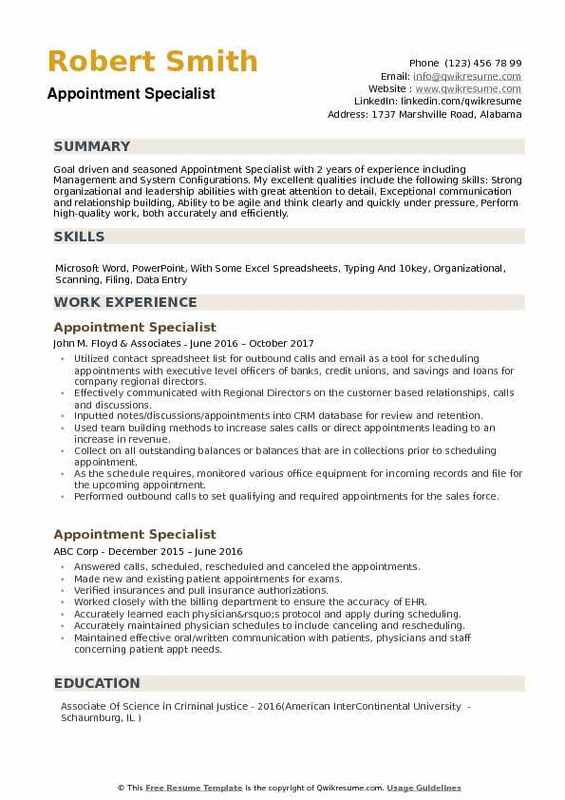 My excellent qualities include the following skills: Strong organizational and leadership abilities with great attention to detail, Exceptional communication and relationship building, Ability to be agile and think clearly and quickly under pressure, Perform high-quality work, both accurately and efficiently. Utilized contact spreadsheet list for outbound calls and email as a tool for scheduling appointments with executive level officers of banks, credit unions, and savings and loans for company regional directors. Effectively communicated with Regional Directors on the customer based relationships, calls and discussions. Inputted notes/discussions/appointments into CRM database for review and retention. Used team building methods to increase sales calls or direct appointments leading to an increase in revenue. Collect on all outstanding balances or balances that are in collections prior to scheduling appointment. As the schedule requires, monitored various office equipment for incoming records and file for the upcoming appointment. Performed outbound calls to set qualifying and required appointments for the sales force.